The simplest snacks are truly the best. Nuts, such as almonds, walnuts, or peanuts, are a nutritious and portable snack. You don't need the latest energy bar or drink. Just grab some roasted nuts (and if you like salt - get the salted ones). I believe most of us have gotten away from eating nuts because they are considered high in calorie - which they are when compared to popcorn or celery. But, compare them to a bag of Doritos and nuts with their nutrient dense and fresh taste are far superior. It is just that we have gotten out of the habit of eating them. Check out those roasted almonds up there. They don't have anything added (no salt or MSG) and they are simply crunchy and satisfying. I know that some of you are wondering about all that FAT! The fat in almonds is mostly the healthy fat - only 1.1 grams is saturated. And eating FAT isn't the problem with getting FAT. We need fats in our diet to be satisfied and for our body to function. Don't fear fat (unless it is a 16 ounce Porterhouse steak). Almonds are an excellent source of vitamin E, magnesium, manganese, and a good source of fiber, copper, phosphorous, and riboflavin. When you think about calories, it is good to reflect on whether those calories are nutrient dense or nutrient poor. 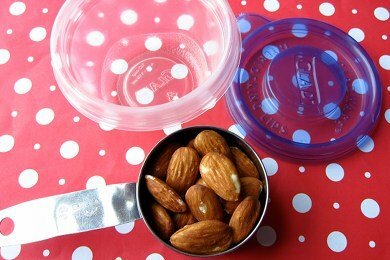 I used a cute little BPA free Glad container for my almonds because that is what I have around the house. California almonds sells these super CUTE little snack tins that are great for stashing in a purse see: California Almond Snack Tins. The entire bag of roasted and unsalted almonds set me back about $8. There are probably more than 10 servings in the bag so compared to other packaged snacks, these are reasonable. Which nuts do you eat and how do you serve them? I have almonds daily. They are definitely my go to snack and have been key to my weight loss success! My kids think nuts are a little boring so we throw in some cheerios, raisins and a few chocolate chips and it all disappears! I can do without the add-ins. Thanks for the reminder of a good snacking food. There's a flavor of almonds that I can only find online at drugstore.com that Blue Diamond makes that is my favorite flavored almonds and those are the butter toffee ones. Of course,they are sweetened with a little sugar but not much. I love nuts! And since I started Weight Watchers I've found that I definitely crave fats like never before - specifically peanut butter and chocolate (I was never a chocolate person before my diet). I eat PB daily now, but perhaps I'll start working in almond butter. Raw nuts are awesome, but for some reason I find 2 Tbs of nut butter on an apple more satisfying - perhaps because I can make it last longer. I love almonds and other nuts. I eat them everyday, maybe a little to much! I keep a stash at work in my desk. Love the healthy fat! Ever since I incorporated fat back into my diet, my hair is shiner, my skin is soft and I feel more full. Love my healthy fat!! I have those same glad containers! Great post -- it's important to make the distinction between high nutrient and low nutrient foods. Nuts are definitely a better option than twinkies! I love all nuts especially almonds. I find that buy ing them sliced (Bazzini's brand) makes them easy to use and helps with portion control. If I'm craving a crunch in my yogurt or salad or whatever, I just sprinkle on a few. I feel a small amount goes further when they are sliced. I love almonds! I usually buy a big bag of Blue Diamond Sea Salt almonds at Walmart and then portion them out to bring to work. If I don't, I end up eating way more than I should - THEY ARE SO GOOD!! I really like those little tins. They look about the size of Altoids tins - I'm sure to have a few of those floating around. Cute idea. Better 'n Peanut Butter is a good substitute (though fairly sweet tasting) for those of us who find we have little self control when it comes to peanut butter. It's peanut-powder based and tastes a bit like peanut butter with the honey already mixed in. Not as good as the real deal, in my book, but only 1 WW Point + per tablespoon. I love nuts! I buy bags of all my fave nuts at Sam's club - go to the baking section, not the snack aisle. They're raw, cheaper, and large bags are great for cooking and measuring out smaller portions for snacking. I keep them all in my freezer so they stay good for a LONG time! Walnuts, almonds, and pecans are my weakness. All are great any way you eat them. I find that if i get raw and unsalted nuts, i eat them slower and can stop eating them easier. When they're roasted and salted, it's hard to stop! ;) I bought some little plastic containers at the Dollar Tree (10 for $1) and they hold a great smaller snack size amount - about 2 Tbsp. Handy when you're on the go! I love almonds and sunflower seeds together, they really add crunch as a salad topping or on soups. Even sprinkled on oatmeal. Super good for you but self control is important. Love the idea of containers .....good article. For years, i've always carried a small container of nuts in my pack for my healthy, on-the-go snack (and usually an apple to go along with the nuts) My favourites are raw almonds, walnuts and brazil nuts. Sometimes i throw in a few raw cacao beans. All very satisfying. I LOVE the Emerald Cocoa Roasted Almonds! So good! I was traveling and not going to be able to have dinner for awhile. I pulled out a snack bag of 16 almonds (110 calories) and 5 dried apricots (84 calories). For just under 200 calories, I was really satisfied and able to pass on many of the unhealthy options I saw until I could have a healthy meal. Not only no vending machines, but no convenience stores or fast food either. Okay -- this is far out there but keep an open mind -- Look up "Edgar Cayce" on the internet and see what he has to say about almonds. He believed that if one were to eat three almonds a day they would never get cancer! Just found your website and found this post looking through the archives. Too funny! I literally have almonds in my desk drawer in that exact same GLAD container as we speak.